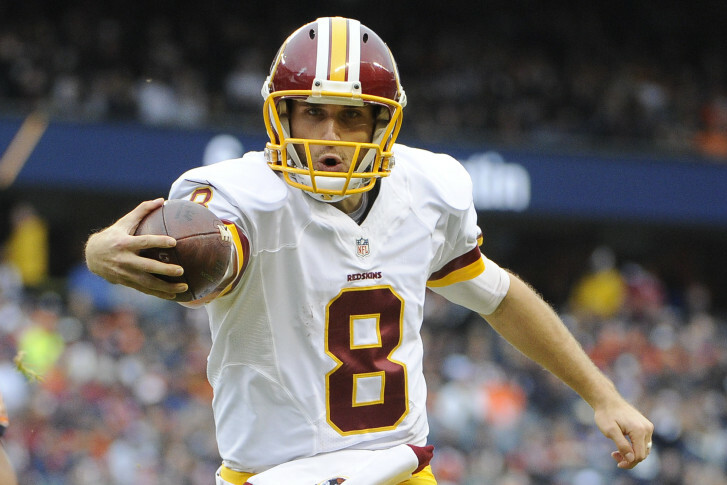 WTOP's Rob Woodfork says the stalled negotiations between Kirk Cousins and the Redskins might not be all bad. ASHBURN, Va. — I’m sure Redskins Nation let out a collective sigh when word broke Tuesday that contract negotiations between the ‘Skins and quarterback Kirk Cousins broke off. Tuesday, as in, the first day teams are allowed to use the franchise tag on their best prospective free agents. I know this runs counter to my position a few weeks ago. I wanted to see Kirk paid sooner rather than later because his level of play was trending up and it makes sense to lock him up long term after one of the greatest single seasons a Redskins quarterback has ever had. I’m also aware of the legitimate fear of repeating the Trent Green situation in 1998: Longtime backup has a career year at the end of his contract and the Redskins either have to pay up or risk being left without a viable long term option. As we all know, Green went on to have a pretty good career elsewhere while the ‘Skins were left with a revolving door of mediocrity at the game’s most important position. However, the fear of repeating the Green error shouldn’t outweigh the desire to avoid more recent history: Robert Griffin III. After his breathtakingly historic rookie season, you couldn’t tell anyone this kid wasn’t going to be one of the NFL’s brightest stars for many years to come. He was electrifying, charismatic, and unlike anything we’d seen before. Then 2013 happened. And worse still, 2014. Now he can’t get out of Ashburn fast enough. Yes, Kirk’s style of play is more sustainable than RG3’s. But you could have said the same thing about Nick Foles in 2013. He threw for 27 TDs and just two picks in 10 starts for the Eagles, but suffered a precipitous drop in production in 2014 (his QB rating plummeted from 119.2 in 2013 to just 81.4 the following season). Now he’s in St. Louis likely to suffer the same fate as RG3. So what better way to see what you’ve really got in Captain Kirk than slapping the franchise tag on him? Now that I’ve had time to digest the 2015 season in its entirety, I can objectively say I’d like to see a bit more of Cousins before committing big money to him. The Redskins had a much easier schedule that we anticipated and the road figures to be more than a tad tougher in 2016. If he performs at a high level against the likes of Arizona, Carolina, Cincinnati and Minnesota there’s no question he’s the long term answer at QB. If he again struggles against elite defenses (as he did in 2015), then Redskins brass will have to wonder if he’s just a good-but-not-great player. That wouldn’t be the worst thing in the world; guys like Teddy Bridgewater, Ryan Fitzpatrick and Alex Smith fall under that category and led teams to winning records. So in a league void of many quality options at QB, you don’t let a guy like that go. The psychological aspect of the franchise tag doesn’t concern me with Kirk. Any questions surrounding his mental toughness have been erased and a full offseason of snaps with the starters — and without RG3 looking over his shoulder — should have his confidence as high as ever. Plus, Cousins has said all along he wants to be in Washington and it’s clear he’s got a good working relationship with coach Jay Gruden, the man that finally gave him a full opportunity as the starter. If Cousins again ranks among the league’s top 10 QBs, he’ll earn himself a boatload of money and the Redskins will happily pay him like an elite signal caller. If he has a down year, the ‘Skins will have overpaid him for just one year instead of five or six. Depending on how far down that performance is, he team could even bring him back at a reduced cost. Either way, Redskins fans gotta like that better than going all in now.